Apple has just released the new iOS 9 software update for all compatible iPhones, iPads and iPod touches and it is now available for download. If you have a compatible device, then you can connect it to iTunes in order to download the update. You can also update over-the-air by opening the Settings app > General > Software Updates. Read on to learn about device compatibility and direct IPSW links for your particular device. 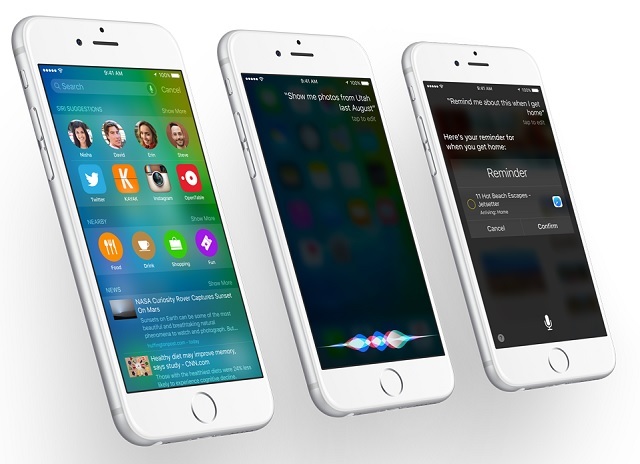 iOS 9 is a major release that brings a range of new features and improvements for all devices. Notable features of the software update include better performance and battery life, Proactive suggestions, new News and Wallet apps, new features for stock applications, iCloud Drive app, split screen multitasking for iPad. iPad specific slide over feature, picture-in-picture and QuickType feature, redesigned and more powerful Siri, improved Spotlight, better security features and more. Just like iOS 8, iOS 9 operating system works on iPhone 6s, iPhone 6s Plus, iPhone 6, iPhone 6 Plus, iPhone 5s, iPhone 5 and iPhone 4S. On the iPad side the upcoming iPad Pro, iPad Air 2, iPad Air, iPad 4th gen., iPad 3rd gen., iPad 2, iPad mini 4, iPad mini 3, iPad mini 2 and original iPad mini are supported. iPod touch 5th and 6th generation can also download the update. We will update this post with direct IPSW links here.